MFS is an autosomal dominant disorder. About 75% of the time, the condition is inherited from a parent, while 25% of the time it is a new mutation. It involves a mutation to the gene that makes fibrillin, which results in abnormal connective tissue. Diagnosis is often based on the Ghent criteria. There is no known cure for Marfan syndrome. Many people have a normal life expectancy with proper treatment. Management often includes the use of beta blockers such as propranolol or atenolol or, if that is not tolerated, calcium channel blockers or ACE inhibitors. Surgery may be required to repair the aorta or replace a heart valve. It is recommended that strenuous exercise be avoided. About 1 in 5,000 to 10,000 individuals have Marfan syndrome. It occurs equally in males and females. Rates are similar between races and in different regions of the world. It is named after Antoine Marfan, a French pediatrician who first described the condition in 1896. More than 30 different signs and symptoms are variably associated with Marfan syndrome. The most prominent of these affect the skeletal, cardiovascular, and ocular systems, but all fibrous connective tissue throughout the body can be affected. Most of the readily visible signs are associated with the skeletal system. Many individuals with Marfan syndrome grow to above-average height, and some have disproportionately long, slender limbs with thin, weak wrists and long fingers and toes. Besides affecting height and limb proportions, people with Marfan syndrome may have abnormal lateral curvature of the spine (scoliosis), thoracic lordosis, abnormal indentation (pectus excavatum) or protrusion (pectus carinatum) of the sternum, abnormal joint flexibility, a high-arched palate with crowded teeth and an overbite, flat feet, hammer toes, stooped shoulders, and unexplained stretch marks on the skin. It can also cause pain in the joints, bones, and muscles. Some people with Marfan have speech disorders resulting from symptomatic high palates and small jaws. Early osteoarthritis may occur. Other signs include limited range of motion in the hips due to the femoral head protruding into abnormally deep hip sockets. Ectopia lentis in Marfan syndrome: Zonular fibers are seen. In Marfan syndrome, the health of the eye can be affected in many ways, but the principal change is partial lens dislocation, where the lens is shifted out of its normal position. This occurs because of weakness in the ciliary zonules, the connective tissue strands which suspend the lens within the eye. The mutations responsible for Marfan syndrome weaken the zonules and cause them to stretch. The inferior zonules are most frequently stretched resulting in the lens shifting upwards and outwards, but it can shift in other directions as well. Nearsightedness and blurred vision are common, but farsightedness can also result particularly if the lens is highly subluxated. Subluxation (partial dislocation) of the lens can be detected clinically in 80% of people with Marfan syndrome by the use of a slit-lamp biomicroscope. If the lens subluxation is subtle, then imaging with high-resolution ultrasound biomicroscopy might be used. Other signs and symptoms affecting the eye include increased length along an axis of the globe, myopia, corneal flatness, strabismus, exotropia, and esotropia. The most serious signs and symptoms associated with Marfan syndrome involve the cardiovascular system: undue fatigue, shortness of breath, heart palpitations, racing heartbeats, or chest pain radiating to the back, shoulder, or arm. Cold arms, hands, and feet can also be linked to MFS because of inadequate circulation. A heart murmur, abnormal reading on an ECG, or symptoms of angina can indicate further investigation. The signs of regurgitation from prolapse of the mitral or aortic valves (which control the flow of blood through the heart) result from cystic medial degeneration of the valves, which is commonly associated with MFS (see mitral valve prolapse, aortic regurgitation). However, the major sign that would lead a doctor to consider an underlying condition is a dilated aorta or an aortic aneurysm. Sometimes, no heart problems are apparent until the weakening of the connective tissue (cystic medial degeneration) in the ascending aorta causes an aortic aneurysm or aortic dissection, a surgical emergency. An aortic dissection is most often fatal and presents with pain radiating down the back, giving a tearing sensation. Because underlying connective tissue abnormalities cause MFS, the incidence of dehiscence of prosthetic mitral valve is increased. Care should be taken to attempt repair of damaged heart valves rather than replacement. Pulmonary symptoms are not a major feature of MFS, but spontaneous pneumothorax is common. In spontaneous unilateral pneumothorax, air escapes from a lung and occupies the pleural space between the chest wall and a lung. The lung becomes partially compressed or collapsed. This can cause pain, shortness of breath, cyanosis, and, if not treated, death. Other possible pulmonary manifestations of MFS include sleep apnea and idiopathic obstructive lung disease. Pathologic changes in the lungs have been described such as cystic changes, emphysema, pneumonia, bronchiectasis, bullae, apical fibrosis and congenital malformations such as middle lobe hypoplasia. Dural ectasia, the weakening of the connective tissue of the dural sac encasing the spinal cord, can result in a loss of quality of life. It can be present for a long time without producing any noticeable symptoms. Symptoms that can occur are lower back pain, leg pain, abdominal pain, other neurological symptoms in the lower extremities, or headaches – symptoms which usually diminish when lying flat. On X-ray, however, dural ectasia is not often visible in the early stages. A worsening of symptoms might warrant an MRI of the lower spine. Dural ectasia that has progressed to this stage would appear in an MRI as a dilated pouch wearing away at the lumbar vertebrae. Other spinal issues associated with MFS include degenerative disc disease, spinal cysts, and dysfunction of the autonomic nervous system. Each parent with the condition has a 50% risk of passing the genetic defect on to any child due to its autosomal dominant nature. Most individuals with MFS have another affected family member. About 15–30% of all cases are due to de novo genetic mutations; such spontaneous mutations occur in about one in 20,000 births. Marfan syndrome is also an example of dominant negative mutation and haploinsufficiency. It is associated with variable expressivity; incomplete penetrance has not been definitively documented. Marfan syndrome is caused by mutations in the FBN1 gene on chromosome 15, which encodes fibrillin-1, a glycoprotein component of the extracellular matrix. Fibrillin-1 is essential for the proper formation of the extracellular matrix, including the biogenesis and maintenance of elastic fibers. The extracellular matrix is critical for both the structural integrity of connective tissue, but also serves as a reservoir for growth factors. Elastic fibers are found throughout the body, but are particularly abundant in the aorta, ligaments and the ciliary zonules of the eye; consequently, these areas are among the worst affected. It can also be caused by a range of intravenous crystal treatments in those susceptible to the disorder. A transgenic mouse has been created carrying a single copy of a mutant fibrillin-1, a mutation similar to that found in the human gene known to cause MFS. This mouse strain recapitulates many of the features of the human disease and promises to provide insights into the pathogenesis of the disease. Reducing the level of normal fibrillin 1 causes a Marfan-related disease in mice. Transforming growth factor beta (TGF-β) plays an important role in MFS. Fibrillin-1 directly binds a latent form of TGF-β, keeping it sequestered and unable to exert its biological activity. The simplest model suggests reduced levels of fibrillin-1 allow TGF-β levels to rise due to inadequate sequestration. Although how elevated TGF-β levels are responsible for the specific pathology seen with the disease is not proven, an inflammatory reaction releasing proteases that slowly degrade the elastic fibers and other components of the extracellular matrix is known to occur. The importance of the TGF-β pathway was confirmed with the discovery of the similar Loeys-Dietz syndrome involving the TGFβR2 gene on chromosome 3, a receptor protein of TGF-β. Marfan syndrome has often been confused with Loeys-Dietz syndrome, because of the considerable clinical overlap between the two pathologies. Marfanoid–progeroid–lipodystrophy syndrome (MPL), also referred to as Marfan lipodystrophy syndrome (MFLS), is a variant of MFS in which Marfan symptoms are accompanied by features usually associated with neonatal progeroid syndrome (also referred to as Wiedemann–Rautenstrauch syndrome) in which the levels of white adipose tissue are reduced. Since 2010, evidence has been accumulating that MPL is caused by mutations near the 3'-terminus of the FBN1 gene. It has been shown that these people are also deficient in asprosin, a gluco-regulatory protein hormone which is the C-terminal cleavage product of profibrillin. The levels of asprosin seen in these people were lower than expected for a heterozygous genotype, consistent with a dominant negative effect. Diagnostic criteria of MFS were agreed upon internationally in 1996. A diagnosis is based on family history and a combination of major and minor indicators of the disorder, rare in the general population, that occur in one individual – for example: four skeletal signs with one or more signs in another body system such as ocular and cardiovascular in one individual. The following conditions may result from MFS, but may also occur in people without any known underlying disorder. The thumb sign (Steinberg's sign) is elicited by asking the person to flex the thumb as far as possible and then close the fingers over it. A positive thumb sign is where the entire distal phalanx is visible beyond the ulnar border of the hand, caused by a combination of hypermobility of the thumb as well as a thumb which is longer than usual. The wrist sign (Walker's sign) is elicited by asking the person to curl the thumb and fingers of one hand around the other wrist. A positive wrist sign is where the little finger and the thumb overlap, caused by a combination of thin wrists and long fingers. There is no cure for Marfan syndrome, but life expectancy has increased significantly over the last few decades[when?] and is now similar to that of the average person. Regular checkups are recommended to monitor the health of the heart valves and the aorta. Marfan syndrome is treated by addressing each issue as it arises and, in particular, preventive medication even for young children to slow progression of aortic dilation. The goal of this treatment strategy is to slow the progression of aortic dilation and prevent any damage to heart valves by eliminating heart arrythmias, minimizing the heart rate, and lowering the person's blood pressure. Probably permissible activities: bowling, golf, skating (but not ice hockey), snorkeling, brisk walking, treadmill, stationary biking, modest hiking, and doubles tennis. Intermediate risk: basketball (both full- and half-court), racquetball, squash, running (sprinting and jogging), skiing (downhill and cross-country), soccer, singles tennis, touch (flag) football, baseball, softball, biking, lap swimming, motorcycling, and horseback riding. High risk: bodybuilding, weightlifting (non-free and free weights), ice hockey, rock climbing, windsurfing, surfing, and scuba diving. Management often includes the use of beta blockers such as propranolol or if not tolerated calcium channel blockers or ACE inhibitors. If the dilation of the aorta progresses to a significant-diameter aneurysm, causes a dissection or a rupture, or leads to failure of the aortic or other valve, then surgery (possibly a composite aortic valve graft or valve-sparing aortic root replacement) becomes necessary. Although aortic graft surgery (or any vascular surgery) is a serious undertaking it is generally successful if undertaken on an elective basis. Surgery in the setting of acute aortic dissection or rupture is considerably more problematic. Elective aortic valve/graft surgery is usually considered when aortic root diameter reaches 50 millimeters (2.0 inches), but each case needs to be specifically evaluated by a qualified cardiologist. New valve-sparing surgical techniques are becoming more common. As people with Marfan syndrome live longer, other vascular repairs are becoming more common, e.g., repairs of descending thoracic aortic aneurysms and aneurysms of vessels other than the aorta. The skeletal and ocular manifestations of Marfan syndrome can also be serious, although not life-threatening. These symptoms are usually treated in an appropriate manner for the condition, such as with pain medications or muscle relaxants. Because Marfan syndrome may cause asymptomatic spinal abnormalities, any spinal surgery contemplated on a person Marfan should only follow detailed imaging and careful surgical planning, regardless of the indication for surgery. Treatment of a spontaneous pneumothorax is dependent on the volume of air in the pleural space and the natural progression of the individual's condition. A small pneumothorax might resolve without active treatment in one to two weeks. Recurrent pneumothoraces might require chest surgery. Moderately sized pneumothoraces might need chest drain management for several days in a hospital. Large pneumothoraces are likely to be medical emergencies requiring emergency decompression. As an alternative approach, custom-built supports for the aortic root are also being used. As of 2017 this procedure has been used in over 100 people with the first case occurring in 2004. During pregnancy, even in the absence of preconception cardiovascular abnormality, women with Marfan syndrome are at significant risk of aortic dissection, which is often fatal even when rapidly treated. 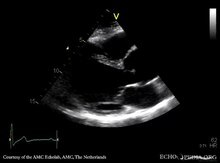 Women with Marfan syndrome, then, should receive a thorough assessment prior to conception, and echocardiography should be performed every six to 10 weeks during pregnancy, to assess the aortic root diameter. For most women, safe vaginal delivery is possible. Marfan syndrome is expressed dominantly. This means a child with one parent a bearer of the gene has a 50% probability of getting the syndrome. In 1996, the first preimplantation genetic testing (PGT) therapy for Marfan was conducted; in essence PGT means conducting a genetic test on early-stage IVF embryo cells and discarding those embryos affected by the Marfan mutation. Prior to modern cardiovascular surgical techniques and drugs such as losartan, and metoprolol, the prognosis of those with Marfan syndrome was not good: a range of untreatable cardiovascular issues was common. Lifespan was reduced by at least a third, and many died in their teens and twenties due to cardiovascular problems. Today, cardiovascular symptoms of Marfan syndrome are still the most significant issues in diagnosis and management of the disease, but adequate prophylactic monitoring and prophylactic therapy offers something approaching a normal lifespan, and more manifestations of the disease are being discovered as more patients live longer. Women with Marfan syndrome live longer than men. Marfan syndrome affects males and females equally, and the mutation shows no ethnic or geographical bias. Estimates indicate about 1 in 5,000 to 10,000 individuals have Marfan syndrome. Marfan syndrome is named after Antoine Marfan, the French pediatrician who first described the condition in 1896 after noticing striking features in a five-year-old girl. The gene linked to the disease was first identified by Francesco Ramirez at the Mount Sinai Medical Center in New York City in 1991. ^ Staufenbiel, Ingmar; Hauschild, Christian; Kahl-Nieke, Bärbel; Vahle-Hinz, Eva; von Kodolitsch, Yskert; Berner, Maike; Bauss, Oskar; Geurtsen, Werner; Rahman, Alexander (2013-01-01). "Periodontal conditions in patients with Marfan syndrome - a multicenter case control study". BMC Oral Health. 13: 59. doi:10.1186/1472-6831-13-59. ISSN 1472-6831. PMC 3816571. PMID 24165013. ^ a b c d e f g h i j k l m n o p "What Is Marfan Syndrome?". NHLBI, NIH. October 1, 2010. Archived from the original on 6 May 2016. Retrieved 16 May 2016. ^ a b "How Is Marfan Syndrome Diagnosed?". NHLBI, NIH. October 1, 2010. Archived from the original on 11 June 2016. Retrieved 16 May 2016. ^ a b c d e f g h i "Marfan Syndrome". National Organization for Rare Disorders. 2017. Retrieved 5 November 2016. ^ a b c d "How Is Marfan Syndrome Treated?". NHLBI, NIH. October 1, 2010. Archived from the original on 11 June 2016. Retrieved 16 May 2016. ^ "What Are the Signs and Symptoms of Marfan Syndrome?". NHLBI, NIH. October 1, 2010. Archived from the original on 11 June 2016. Retrieved 16 May 2016. ^ a b Marfan, Antoine (1896). "Un cas de déformation congénitale des quartre membres, plus prononcée aux extrémitiés, caractérisée par l'allongement des os avec un certain degré d'amincissement [A case of congenital deformation of the four limbs, more pronounced at the extremities, characterized by elongation of the bones with some degree of thinning]". Bulletins et Memoires de la Société Medicale des Hôspitaux de Paris (in French). 13 (3rd series): 220–226. ^ a b "Antoine Bernard-Jean Marfan". Whonamedit?. Archived from the original on 8 March 2016. Retrieved 16 May 2016. ^ Van de Velde, S; Fillman, R; Yandow, S (2006). "Protrusio acetabuli in Marfan syndrome. History, diagnosis, and treatment". The Journal of Bone and Joint Surgery. American Volume. 88 (3): 639–46. doi:10.2106/JBJS.E.00567. PMID 16510833. ^ a b c d "OMIM Entry - # 154700 - MARFAN SYNDROME; MFS". omim.org. Retrieved 2016-08-08. ^ Zipes, Libby Bonow Braunwald (2005). Braunwald's Heart Disease ~ A Textbook of Cardiovascular Medicine, Seventh Edition. United States of America: Elseview Saunders. p. 1894. ISBN 978-0-7216-0509-8. ^ a b Dyhdalo, K; Farver, C (2011). "Pulmonary histologic changes in Marfan syndrome: a case series and literature review". American Journal of Clinical Pathology. 136 (6): 857–63. doi:10.1309/AJCP79SNDHGKQFIN. PMID 22095370. ^ Siepe, M; Löffelbein, F (2009). "[The Marfan syndrome and related connective tissue disorders]". Medizinische Monatsschrift für Pharmazeuten. 32 (6): 213–9. PMID 19554831. ^ a b Kohler, M.; Blair, E.; Risby, P.; Nickol, A. H.; Wordsworth, P.; Forfar, C.; Stradling, J. R. (2009-02-01). "The prevalence of obstructive sleep apnoea and its association with aortic dilatation in Marfan's syndrome". Thorax. 64 (2): 162–166. doi:10.1136/thx.2008.102756. ISSN 1468-3296. PMID 18852161. ^ Corsico, A. G.; Grosso, A.; Tripon, B.; Albicini, F.; Gini, E.; Mazzetta, A.; Di Vincenzo, E. M.; Agnesi, M. E.; Tsana Tegomo, E. (2014-06-01). "Pulmonary involvement in patients with Marfan Syndrome". Panminerva Medica. 56 (2): 177–182. ISSN 1827-1898. PMID 24994580. ^ "Marfan Syndrome". Mayo Clinic. Archived from the original on January 10, 2007. Retrieved January 12, 2007. ^ a b Cotran; Kumar, Collins (1998). Robbins Pathologic Basis of Disease. Philadelphia: W.B Saunders Company. ISBN 978-0-7216-7335-6. ^ Judge DP, Biery NJ, Keene DR, et al. (2004). "Evidence for a critical contribution of haploinsufficiency in the complex pathogenesis of Marfan syndrome". The Journal of Clinical Investigation. 114 (2): 172–81. doi:10.1172/JCI20641. PMC 449744. PMID 15254584. ^ Judge DP, Dietz HC (2005). "Marfan's syndrome". Lancet. 366 (9501): 1965–76. doi:10.1016/S0140-6736(05)67789-6. PMC 1513064. PMID 16325700. ^ McKusick V (1991). "The defect in Marfan syndrome". Nature. 352 (6333): 279–81. Bibcode:1991Natur.352..279M. doi:10.1038/352279a0. PMID 1852198. ^ Pereira L, Lee SY, Gayraud B, et al. (1999). "Pathogenetic sequence for aneurysm revealed in mice underexpressing fibrillin-1". Proceedings of the National Academy of Sciences of the United States of America. 96 (7): 3819–23. Bibcode:1999PNAS...96.3819P. doi:10.1073/pnas.96.7.3819. PMC 22378. PMID 10097121. ^ Entrez Gene (2007). "TGFBR2 transforming growth factor, beta receptor II" (Entrez gene entry). NCBI. Archived from the original on January 13, 2007. Retrieved January 11, 2007. ^ "Related Disorders: Loeys-Dietz". National Marfan Foundation. Archived from the original on September 25, 2006. Retrieved January 11, 2007. ^ "OMIM Entry - #616914 - MARFAN LIPODYSTROPHY SYNDROME; MFLS". omim.org. Retrieved 2016-12-06. ^ Graul-Neumann LM, Kienitz T, Robinson PN, Baasanjav S, Karow B, Gillesen-Kaesbach G, Fahsold R, Schmidt H, Hoffmann K, Passarge E (2010). "Marfan syndrome with neonatal progeroid syndrome-like lipodystrophy associated with a novel frameshift mutation at the 3-prime terminus of the FBN1-gene". Am. J. Med. Genet. 152A (11): 2749–2755. doi:10.1002/ajmg.a.33690. PMID 20979188. ^ Jacquinet A, Verloes A, Callewaert B, Coremans C, Coucke P, De Paepe A, Kornak U, Lebrun F, Lombret J, Pierard GE, Robinson PN, Symoens S, Van Maldergem L, Debray FG (2014). "Neonatal progeroid variant of Marfan syndrome with congenital lipodystrophy results from mutations at the 3' end of FBN1 gene". Eur. J. Med. Genet. 57 (5): 230–234. doi:10.1016/j.ejmg.2014.02.012. PMID 24613577. ^ Romere C, Duerrschmid C, Bournat J, Constable P, Jain M, Xia F, Saha PK, Del Solar M, Zhu B, York B, Sarkar P, Rendon DA, Gaber MW, LeMaire SA, Coselli JS, Milewicz DM, Sutton VR, Butte NF, Moore DD, Chopra AR (April 2016). "Asprosin, a Fasting-Induced Glucogenic Protein Hormone". Cell. 165 (3): 566–79. doi:10.1016/j.cell.2016.02.063. PMC 4852710. PMID 27087445. ^ De Paepe A, Devereux RB, Dietz HC, Hennekam RC, Pyeritz RE (1996). "Revised diagnostic criteria for the Marfan syndrome". Am. J. Med. Genet. 62 (4): 417–26. doi:10.1002/(SICI)1096-8628(19960424)62:4<417::AID-AJMG15>3.0.CO;2-R. PMID 8723076. ^ Finkbohner R, Johnston D, Crawford ES, Coselli J, Milewicz DM (1995). "Marfan syndrome. Long-term survival and complications after aortic aneurysm repair". Circulation. 91 (3): 728–33. doi:10.1161/01.CIR.91.3.728. PMID 7828300. Archived from the original on 2010-01-13. ^ "Marfan Syndrome: Signs and Symptoms". www.ucsfhealth.org. Archived from the original on 2010-06-17. Retrieved 2009-08-28. ^ "What is Marfan Syndrome?". Marfan Trust. Archived from the original on 2015-06-10. Retrieved 2015-06-01. 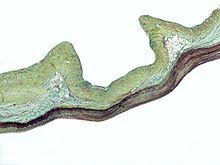 ^ "Marfan Syndrome: The Similarities to Copper Deficiency". www.ctds.info. Archived from the original on 2009-02-21. Retrieved 2009-08-29. ^ "Marfan syndrome". Genetics Home Reference. U.S. National Institute of Health. Archived from the original on 2009-08-29. Retrieved 2009-08-28. ^ Kohlmeier L, Gasner C, Bachrach LK, Marcus R (1995). "The bone mineral status of patients with Marfan syndrome". Journal of Bone and Mineral Research. 10 (10): 1550–5. doi:10.1002/jbmr.5650101017. PMID 8686512. ^ a b "About Marfan Syndrome: Features". National Marfan Foundation. Archived from the original on 2009-08-20. Retrieved 2009-08-28. ^ "Living with Marfan Syndrome: Dental issues". National Marfan Foundation. Archived from the original on 2009-09-06. Retrieved 2009-08-28. ^ "2010 Revised Ghent Nosology". National Marfan Foundation. Archived from the original on 2011-01-14. Retrieved 2011-01-31. ^ Loeys, BL; Dietz, HC; Braverman, AC; Callewaert, BL; De Backer, J; Devereux, RB; Hilhorst‑Hofstee, Y; Jondeau, G; Faivre, L; Milewicz, DM; Pyeritz, RE; Sponseller, PD; Wordsworth, P; De Paepe, AM (2010). "The revised Ghent nosology for the Marfan syndrome" (PDF). Journal of Medical Genetics. 47 (7): 476–485. doi:10.1136/jmg.2009.072785. ISSN 0022-2593. OCLC 857424767. PMID 20591885. Archived (PDF) from the original on 10 January 2016. ^ Rimoin DL, Connor JM, Pyeritz RE, et al. (2007). Emery and RImoin's Principles and Practice of Medical Genetics. 5th ed. Philadelphia, Pennsylvania: Churchill Livingstone Elsevier. ^ "Questions and Answers about Marfan Syndrome". Niams.nih.gov. Archived from the original on 9 April 2014. Retrieved 23 June 2014. ^ Maron BJ, Chaitman BR, Ackerman MJ, Bayés de Luna A, Corrado D, Crosson JE, Deal BJ, Driscoll DJ, Estes NA, Araújo CG, Liang DH, Mitten MJ, Myerburg RJ, Pelliccia A, Thompson PD, Towbin JA, Van Camp SP (8 June 2004). "AHA Scientific Statement: Recommendations for Physical Activity and Recreational Sports Participation for Young Patients With Genetic Cardiovascular Diseases". Circulation. 109 (22): 2807–2816. doi:10.1161/01.cir.0000128363.85581.e1. ISSN 0009-7322. OCLC 110943757. PMID 15184297. Archived from the original on 27 June 2015. ^ "Elective Aortic Root Surgery in Marfan Syndrome Appears Safe and Durable: Presented at STS" (Press release). Doctor's Guide. January 31, 2008. Archived from the original on November 20, 2008. Retrieved January 13, 2009. Cameron DE, Vricella LA (2005). "Valve-sparing aortic root replacement in Marfan syndrome". Seminars in Thoracic and Cardiovascular Surgery. 8 (1): 103–11. doi:10.1053/j.pcsu.2005.03.001. PMID 15818365. Gott VL, Cameron DE, Alejo DE, et al. (2002). "Aortic root replacement in 271 Marfan patients: a 24-year experience". The Annals of Thoracic Surgery. 73 (2): 438–43. doi:10.1016/S0003-4975(01)03336-7. PMID 11845856. Bethea BT, Fitton TP, Alejo DE, et al. (2004). "Results of aortic valve-sparing operations: experience with remodeling and reimplantation procedures in 65 patients". The Annals of Thoracic Surgery. 78 (3): 767–72, discussion 767–72. doi:10.1016/j.athoracsur.2004.03.040. PMID 15336989. ^ "Heart Surgery for Marfan Syndrome". Mayo Clinic. Archived from the original on December 18, 2006. Retrieved January 12, 2007. ^ a b Treasure, Tom; Petrou, Mario; Rosendahl, Ulrich; Austin, Conal; Rega, Filip; Pirk, Jan; Pepper, John (September 2016). "Personalized external aortic root support: a review of the current status". European Journal of Cardio-Thoracic Surgery. 50 (3): 400–404. doi:10.1093/ejcts/ezw078. PMID 27032474. ^ Treasure T, Golesworthy T, Pepper J (September 2017). "Practical clinical applications of 3-D printing in cardiovascular surgery". Journal of Thoracic Disease. 9 (9): 2792–2797. doi:10.21037/jtd.2017.08.63. PMC 5708385. PMID 29221242. ^ Chen H (2007). "Marfan Syndrome". Cell and Tissue Research. 347 (1): 267–77. doi:10.1007/s00441-011-1270-y. PMID 22105919. Archived from the original on July 6, 2009. Retrieved June 25, 2007. ^ Harton GL, Tsipouras P, Sisson ME, et al. (1996). "Preimplantation genetic testing for Marfan syndrome". Mol. Hum. Reprod. 2 (9): 713–15. doi:10.1093/molehr/2.9.713. PMID 9239687. ^ Keane, Martin G.; Pyeritz, Reed E. (2008). "Medical Management of Marfan Syndrome". Circulation. 117 (21): 2802–2813. doi:10.1161/CIRCULATIONAHA.107.693523. ISSN 1524-4539. PMID 18506019. Archived from the original on 2016-03-20. ^ Fusar-Poli P, Klersy C, Stramesi F, Callegari A, Arbustini E, Politi P (2008). "Determinants of quality of life in Marfan syndrome". Psychosomatics. 49 (3): 243–8. doi:10.1176/appi.psy.49.3.243. PMID 18448780. Archived from the original on 2012-07-13. ^ Johns Hopkins Comprehensive Marfan Center. Archived 2008-10-15 at the Wayback Machine Johns Hopkins Medicine. Retrieved on January 6, 2009. ^ Brown P (July 27, 1991). "Marfan syndrome linked to gene". Archived 2015-01-29 at the Wayback Machine New Scientist. Retrieved on August 11, 2008. Wikimedia Commons has media related to Marfan syndrome.